But God thought fit to take him to his eternal rest. Never forgotten by his Father, Mother Brothers and Sister. 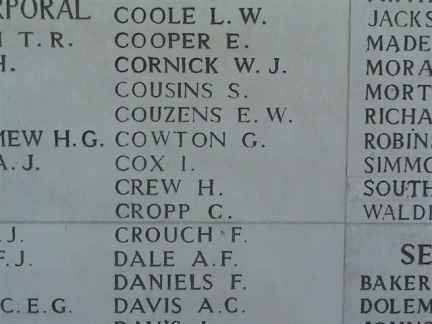 There seems to be some confusion over the spelling of the name Couzens either with an S or a Z. The newspaper report publishes his name with a S yet the CWGC, Menin Gate and Soldiers Died have it with a Z. This is the same spelling on the MEdal Index Card.